I met him at a Minor League game at Jack Russell Memorial Stadium in Clearwater, Florida in 1993, when the Daytona Cubs came to play the Clearwater Phillies. I am forever grateful for meeting Brant. When I handed him the card for him to sign, he asked me, "did you rub the gloss off?" I was sort of confused and said no. He then proceeds to take his thumbs and rub the front of the card. He explained doing this will prevent the autograph from smearing. It's a lesson I used throughout my autograph collecting years, especially as more and more card companies went toward glossier coated finishes. 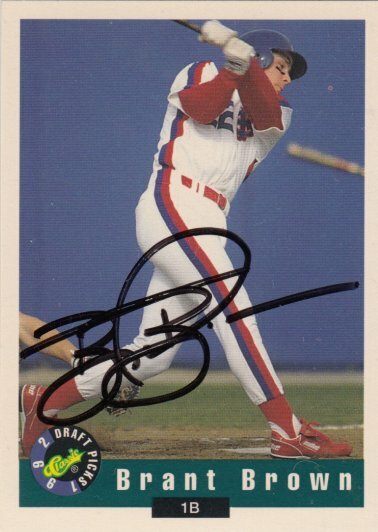 Brant signed a 1992 Classic Draft Picks card #58.